Home/Uncategorized/DevOps is a culture, not a role! CI (continuous integration) to automate code builds and enable faster feedback and iteration through more frequent, lower risk releases. DevOps is a cultural perspective on how everyone should be engaged in working the right way. In a software-defined world appears a pile of questions. How do we get something into production quickly and once it is in production? How do we know we’ve come up with the best solution? How quickly can we apply improvements and updates? 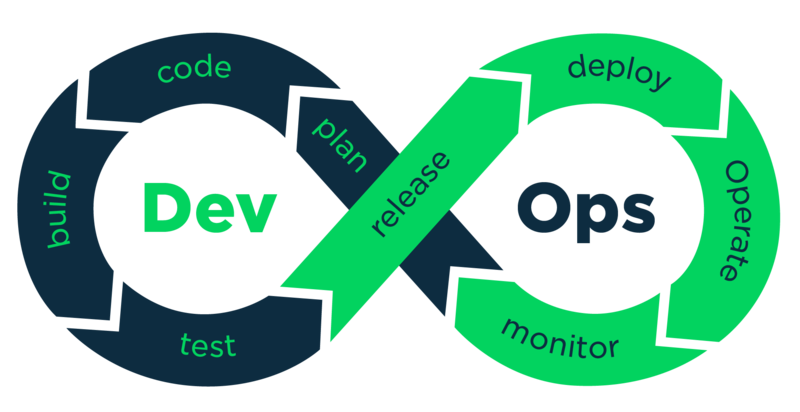 DevOps aims to include everyone who has a stake in the game by involving them early on in the collaborative process. Achieving that success with DevOps starts with understanding the key business benefits. Organisations are able to move faster with less downtime and fewer security issues. DevOps is a culture, not a role! The whole company needs to be doing DevOps for it to work. There needs to be backing from senior leadership, but also involvement from everyone with a stake in the final product, not just development and operations departments. I used to read a white paper by Puppet about how can we build a high-performing IT-team. And Section A had a bunch of interesting theories and practices I’d like to share to with you. DevOps cuts deep and wide through industries, company sizes and technology environments. Nevertheless, there’s a common refrain from IT-managers who are leading successful DevOps transformations within their organizations. DevOps is about continual learning and improvement rather than an end state. Like many of IT leaders, you’re asked to notonly deliver more products and services than ever before, but to do so with greater speed and quality — and with no hits to reliability or security. DevOps seems like it will really help! But…you’re running into skepticism your team before you have even really begun. How do you make a clear, convincing case for DevOps that reduces fear and converts skeptics into champions? People don’t buy what those leaders are doing but why they’re doing it. The same idea holds true when building organizational buy-in for a DevOps transformation. Simply declaring “We’re doing DevOps” is not going to get people on board. Instead, you need a compelling answer to the questions “Why? And why now?”. All our customers want to move faster without compromising the reliability and stability of their systems — goals that directly conflict with each other in traditional organizations. Developers are tasked with getting new features into production as fast as possible. Operations guys, meanwhile, are measured on the uptime and performance of systems. So these teams become adversaries instead of allies. As a result, deployments to production are plagued by delays and errors, and they occur far less frequently than the business really needs. How quickly can code move from a dev’s laptop to production? How often are you deploying now vs then? Have deployments becomes easier and faster? Uptime/downtime: Are you better able to meet your service-level requirements? Has downtime decreased? Change fail rate: Have failures decreased? Mean time to recover: Have you shrunk the time it takes to roll back to your last known good state when a failure occurs? Start small and grow from early successes. You can’t change the whole program, but you can start by getting a few of your sub teams going in the right direction. It can be helpful to bring in someone from the outside to automate a few tests or builds and give the team some examples to build on. Raytheon enabled one of its teams to shift from two integration procedures per month to running 27 of them in a single night as a result of automating its builds. That’s a big win on a single initiative, and it became part of Potts’ broader case for growing DevOps within the organization.